Camden is an adorable little guy who is one year old! He was born with two heart defects known as a PDA and an ASD. His file indicates that he might have some issues with hearing out of his left ear. His file was prepared when he was 10 months old and he is currently living in a foster home. He is described as being cheerful and giggly! 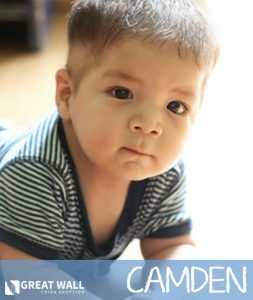 Camden is babbling and will make eye contact while engaging with you. He knows familiar people and can understand adult’s facial expressions. He can understand the meaning of simple words like “hi” and “bye-bye”. He can sit up on his own, grasp objects and can transfer toys from one hand to the other. He can hold his own milk bottle to drink on his own. Contact one of our matching specialists today if you’d like to review Camden’s file! Meet Kellen! 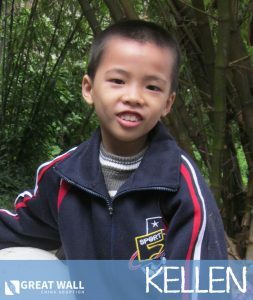 Kellen is a darling 9-year old boy with hemophilia looking for a family to call his own. He has some cognitive development compared to his peers, but he is currently taking classes on language, math, art, music, and physical education. He has to be more cautious when being physical active given his need, but overall he is an active kiddo. His favorite activities including singing, drawing, and playing games with his friends. If you would like to learn more about Kellen, please reach out to Great Wall! 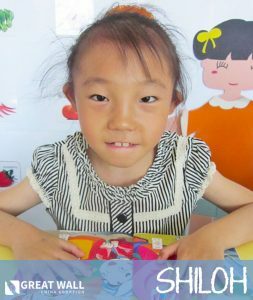 Shiloh is a precious little girl from China that is 6 and a half years old. Shiloh was abandoned when she was 3 years old and came into care at that time. It is presumed that Shiloh lived with her family before that time. 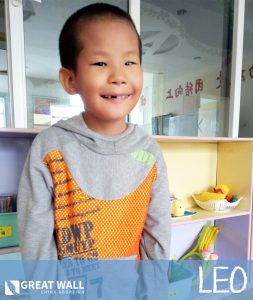 Shiloh now lives in a foster family and goes to school in the local orphanage. Shiloh’s file indicates that she has some cognitive delays and that she may need extra help catching up. Shiloh’s langue comprehension ability is good and she can speak 2-3 sentences at a time to express her needs. She has some trouble with pronunciation of some words and has a smaller vocabulary than some of her peers of the same age, and she sometimes uses signs to express herself. Shiloh enjoys group activities and likes playing with other children. Shiloh likes to be praised when she does a good job and so she will actively demonstrate her work to her teachers. She enjoys living in her foster family, where she has a younger foster sister that she enjoys very much. She likes to protect and care for her younger foster sister and she likes to give her hugs. Shiloh has good motor skills; she can walk, run, jump and go up and down stairs. Shiloh also has good fine motor skills such as using a pen to color, eating with chopsticks, and picking out specific small objects from among other different small objects. You can contact the China Home Finding Team at Great Wall if you would like to learn more about adopting Shiloh. We hope we are able to find Shiloh her Forever Family soon! Clark is a happy kiddo who is 7 years old! He was recently apart of GWCA’s JOY Program in China. 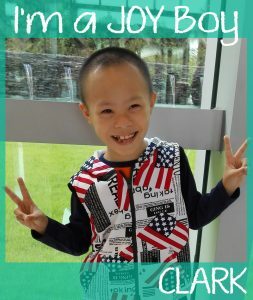 An advocate spent some time with Clark and learned all about him! Clark is fairly delayed on his language development but we believe that with the proper care and attention he would be able to catch up! He is described as being shy but his teachers and classmates love him. He likes to share his toys and things and is said to be modest! Clark does not have any physical limitations and is able to be active! He is receiving education in the orphanage and is being taught basic life skills. Contact GWCA if you’d like to review Clark’s file! Click Here to Watch Clark’s Video! This amazing kiddo’s name is Jonathan, and he is 13 years old! Jonathan is completely deaf in both ears, but his cognitive and mobility development are on-target. He can communicate well using writing and hand gestures and is able to write about 40 simple English words. He is very helpful to his teachers and does well very well in school! He also love sports, and is great at jump rope, ping-pong, and badminton! 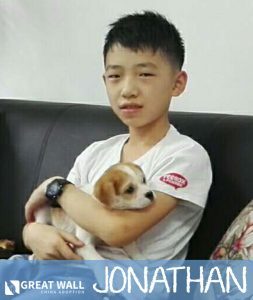 If you’d like to learn more about Jonathan, please reach out to Great Wall! heck out my NEW video! Spencer is a cheerful kiddo who is 11 years old! He was recently apart of GWCA’s JOY Program in China. 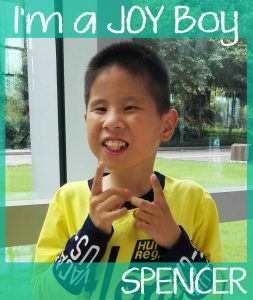 An advocate spent some time with Spencer and learned all about him! He has congenital esotropia of both eyes. Spencer lives in a foster family and has for quite some time. His foster parents describe him as very active, positive and happy! He loves to communicate with others and is constantly sharing what he observes and feels with his classmates and friends. He is currently in the 3rd grade! His file indicates that his vision needs present some challenges for him in regards to reading and writing. Spencer enjoys extracurricular activities and playing outside. Contact one of our matching specialists today if you are interested in reviewing Spencer’s file! Click Here to Watch Spencer’s Video! Tristan is a smiley kiddo who is 7 years old! He was recently apart of GWCA’s JOY Program in China. 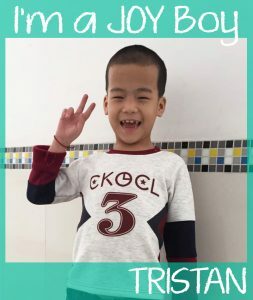 An advocate spent some time with Tristan and learned all about him! He was born with Hydrocephalus but it doesn’t seem to affect his daily life at all. The advocates that met him mentioned that his understanding ability is great and that he doesn’t have any issues communicating. He has excellent pronunciation and can speak in full sentences. Tristan is described as being extroverted and friendly. Click Here to Watch Tristan’s Video!